I’ve written a book about growing successful online communities. It’s getting great reviews. I’m featured in this article on Mashable, and this one too. Want to go a little deeper? Here are a few interviews that reveal my thoughts on community management: Online Community Report; emoderation; Online Journalism Blog Le Blog du Community Management. See my complete list of popular posts. I’m also a regular contributor over at SiliconANGLE . Follow me. You’ll be glad you did. HIRE me. You won’t be disappointed. 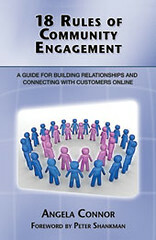 Check out my book website Growing Successful Online Communities and sign up for free chapter. Jusy finished the book Angela, enjoyed it very much. I liked the practical advice and real-community examples. We run several communities here in Australia, some smaller, some larger than yours, but your rules apply here as well – thanks for putting them together as a guide to success. Your book will help bring new community managers up to operating speed quickly. (Good relaxed writing style makes it very un-text book, easy & fun to read). I can’t thank you enough for taking the time to read the book. I’m glad you enjoyed it, I certainly hope you are right about community managers being brought up to speed. What we do is still new and in many cases undefined. That is one of the main reasons I wanted to share my experiences. And who wants to read a bunch of jargon anyway? I tried to make it very conversational. One key difference between your community and the communities I have been involved with – we generally know who the member is (they log in) and we integrate the members comments, votes, ideas in the community with CRM systems. This all happens back office of course, and all of your 18 (who says community facilitation is simple!) rules still apply. Excellent blog! I look forward to working my way through all the great info and advice. Your book is at the top of my “to get” list. Hi Michelle: Thank you for the kind words about the blog and your interest in my book. I’m always happy to talk community so please feel free to connect as you move through the content. Hello Angela, thanks for taking time to speak with me on the phone. I am studying you book now. Remember that I told you that “I believe you”. I will be calling on you to help with my site http://TheObituaries.org . Please feel free to visit and offer suggestions.